General-purpose signal conditioners for Programmable Logic Controllers. Omega offers a general-purpose signal conditioning product designed to augment the capabilities of any Programmable Logic Controller (PLC). 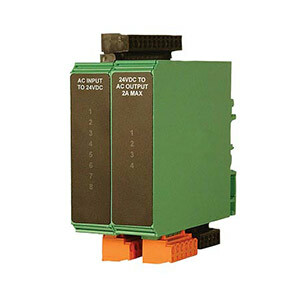 These signal conditioners allow normally incompatible signals and loads (AC inputs, AC outputs, etc.) to easily interface with any PLC. Three categories of these products are available — those which convert AC inputs to DC outputs and DC inputs to AC outputs, those which drive specialized digital output loads, and those which allow analog signals to be generated from digital PWM outputs. One model allows the connection of AC inputs to PLCs having only digital inputs: the HE-XDIA converts 120/240 Vac AC inputs to 24 Vdc (8 points). Three signal conditioning devices allow the standard 24 Vdc, 0.5 A outputs of a PLC to drive specialized loads. The solid-state HE-XDQA allows a 120/250 Vac load to be driven at up to 2 A (four points). The solid state HE-XDQD will drive a 24 Vac/24 Vdc load at up to 3 A (four points). The HE-XDQR provides relay outputs that can drive up to a 10A load, supporting voltages of 120/250 Vac and 24/30 Vdc (four points). Two signal conditioning devices provide a PLC with additional analog outputs, by converting 24 Vdc PWM outputs already present on the controllers. The HE-XPC converts 24 Vdc PWM outputs to 4 to 20 mA (2 channels), while the HE-XPV converts 24 Vdc PWM outputs to 0 to 10V (two channels). Note: Models HE-XDIA, HE-XPC, and HE-XPV require 24 Vdc power.